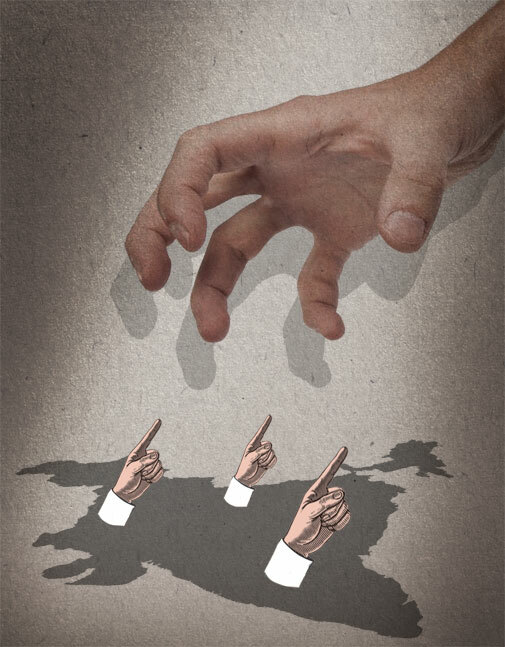 THE most powerful, though never sighted, political unifier in India is back: the foreign hand. The National Democratic Alliance government recently went after the Ford Foundation for funding “political” and “disruptive” activities. And hardly a few hours after the announcement, it cancelled the registration of nearly 9,000 non-government organisations (NGOs) for violating the rules governing foreign funds. At the same time, it stopped a Greenpeace activist from flying abroad to make a presentation on how a community is fighting a coal mine project in the country. Pursuing this obsession, the Union environment minister has publicly said that the recent focus on air pollution in Delhi is part of a “design” to malign the country. The Union minister cited a “foreign hand” because the air pollution data came from machines installed at an embassy. He has questioned why nobody talked about air pollution in the capital in the past 10 years. It is another matter that hardly a day goes by without the newspapers carrying a story on Delhi’s alarming air pollution. This is not the first government that is obsessed with the foreign hand theory. The previous prime minister, Manmohan Singh, attributed “foreign hand” to the anti-nuclear campaigns. And when his government was shrouded with corruption charges that led to its miserable fall in the general elections next year, Singh’s key ministers questioned civil society groups and their intentions citing foreign funds. This was surprising because there was a period when the government was seen as “NGO-wallas” due to its leadership’s engaging relationship with civil society. Equally surprising is the current government’s actions against NGOs and donors because, as stated by Prime Minister Narendra Modi and his ministers, its focus is on salvaging the image of the country in the international arena. Then why would the government risk going after a US charity that has the potential of a diplomatic fallout? The Ford Foundation has also helped implement many government schemes, including a few flagship schemes in Gujarat, when Modi was the state chief minister. This is where the larger question of intent comes. The Union government took action against Ford Foundation after the Gujarat government complained that the foundation supported a few activists who were campaigning against the state’s involvement in the 2002 communal riots. Similarly, the NGOs that were forced to shut shop were mostly opposing mining and industry projects and fighting for the legitimate rights of communities. The political leadership wants to polarise the development discourse in the country by hitting out at any NGO that is protesting development projects. And the leadership seems to be successful as whenever genuine environmental concerns are raised, it automatically ends in a debate over development v environment. At a time when the middle class is calling the political shots, development has taken precedence over environment. The growth rate has to be revived and the government has conveniently made us believe that the growth is not happening because of opposition to projects on environmental concerns. A polarised discourse is easy to manage, at least while dealing with daily anti-government headlines, according to former BJP minister Arun Shourie. The current leadership believes it will be able to salvage its image through this. But the point it misses is that polarisation is an enemy in the long-term. The government might be able to slow down NGOs but what will it do when the people come out on the streets to protect their rights. That is a much bigger and difficult headline to manage.